With holidays around the corner, the competition for your living room is already starting to heat up! PlayStation is first to strike with a rumored upcoming $50 price drop, but retailers like Target and Amazon are jumping the bandwagon and providing their own $50 off, by way of their respective stores gift card. 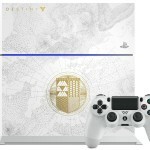 Now, you can get the limited edition PlayStation 4 500GB Console – Destiny: The Taken King Bundle for its regular price of $399, but add on a $50 Amazon Gift Card. The fine print states: Buy the PlayStation 4 Destiny Bundle and get a $50 Amazon.com credit. Credit and redemption instructions will be emailed to you within two days of your completed shipment. Offer valid only when shipped and sold by Amazon.com. Limited time offer. What does this PS4: Destiny Bundle include? Purchase Your PS4 Destiny Bundle! What do you think? Is the $50 Amazon Gift Card enough for you to take the plunge? Or are you going to wait for Black Friday?! Tweet us @AsianGeekSquad.